Catamaran Charter Greece is proud to offer you a Fountaine Pajot Lucia 40 catamaran for rent. This all new sailing catamaran available for rental from summer 2016 onward is a smaller model from Fountain Pajot family Helia 44 catamarans, Saba 50 and now the Ipanema 58 catamarans available for charter as well in Greece with us. The Quintet version is ideal for charter operators and families, with its four double cabins that each include private ensuites. The shared bathroom option is also available for this layout. The new Fountaine Pajot Lucia 40 sailing catamaran for rent to explore islands Zakynthos, Mykonos, Paros, Milos and others. Charter catamaran Fountaine Pajot Lucia 40 is a amazing choice to explore Greece with an spaces 40 foot catamaran. This new catamaran for rent in Greece Fountaine Pajot Lucia 40 is available for hire now and enjoy a 4 bedroom apartment cursing around the Cyclandes islands or Ionian islands and fulfilling your sailing holidays in Greece with joy. 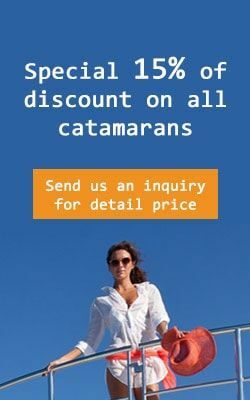 Charter catamaran Fountaine Pajot Lucia 40 for rent in Greece and let us catapult you away for an unforgettable charter journey along the Greece islands from Athens, Lavrion, Mykonos, Lefkada but soon from all bases in Greece. Available for catamaran Crewed with our professional crew this all new sailing yacht can be rented for one way charters to and from Athens to Mykonos or Santorini as well as other famous islands subject to availability. Send us an Inquiry right now to secure top prime dates avoiding disappointment later or availability risks. The Quintet version is ideal for charter operators and families, with its four double cabins that each include private ensuites. The shared bathroom option is also available for this layout. The new Fountaine Pajot Lucia 40 sailing catamaran for rent to explore Cyclades islands like Mykonos, Paros, Santorini. Charter catamaran Fountaine Pajot Lucia 40 is a amazing choice to explore Greece with an spaces 40 foot catamaran. This new catamaran for rent in Greece Fountaine Pajot Lucia 40 is available for hire now and enjoy a 4 bedroom apartment cursing around Cyclades islands and fulfilling your sailing holidays in Greece with joy.